The investigation into Russian interference in last year’s election shifted into a major new phase this week, when special counsel Robert Mueller unveiled charges against three Trump campaign officials—including former campaign chairman Paul Manafort—and produced the most explicit evidence to date that Trump’s team sought assistance from Russian operatives. 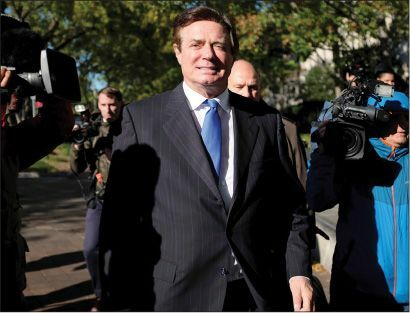 Manafort and his longtime business partner Rick Gates were indicted on a dozen charges relating to their lobbying work for a Kremlin- backed political party in Ukraine between 2006 and 2015. The indictment accuses the two men of laundering tens of millions of dollars through a complex web of foreign corporations and bank accounts; giving Justice Department investigators false or misleading statements; and violating several lobbying and banking laws. Both men pleaded not guilty. Manafort was deemed a flight risk—he had three U.S. passports—and he and Gates were placed under house arrest. In what might prove to be a more significant development, Mueller’s team also revealed they had struck a plea deal with former Trump foreign policy adviser George Papadopoulos to provide information to investigators, after he admitted having lied to them about his contacts with Russian officials. Court documents show that Papadopoulos met Joseph Mifsud, a London-based professor with connections to the Kremlin, shortly after joining Trump’s campaign in March last year. Over the next three to four months, Mifsud introduced Papadopoulos to at least two other Kremlin-linked individuals, and told him Moscow had “dirt” on Hillary Clinton in the form of “thousands of emails.” Papadopoulos repeatedly tried to broker a meeting between Trump and his top aides and the Russian government. Manafort, the indictment said, wrote in an email Trump should not do such a meeting. “It should be someone low level in the campaign so as not to send any signal,” Manafort wrote. Mueller’s indictments should put to rest the claim that the Russia investigation is a “witch hunt,” said the New York Daily News. While working on Trump’s campaign, Papadopoulos met and corresponded with Kremlin-linked operatives on several occasions. He shared details of his Russian outreach at a meeting attended by Trump. And his Russian connection dangled the promise of releasing “thousands of emails” that would hurt Clinton—an offer he almost certainly passed on to his superiors. Those emails were released via WikiLeaks a few months later. So far, there’s no “smoking gun” on collusion, said Ezra Klein in Vox.com, but consider what we already know. Trump’s campaign was filled with people who had secretive and shady connections with Russia and were eager to meet Russians offering dirt on Clinton. At least one adviser knew about Moscow’s hacked emails before they were published. And after becoming president, Trump fired his FBI director and publicly admitted he did so to end “the Russia thing”—an act that may lead to an obstruction of justice charge. Given all of these known facts, is it really possible that there was no explicit cooperation between Russia and the Trump campaign?